Light-duty saw provides powerful cutting on limbs, branches and unwanted shrubbery. The summer drought drained the life out of a dozen scraggly bushes along our back fence this year, so when I had the chance to test Oregon-Blount's new battery-powered chainsaw, that "hedgerow" of dead shrubbery was the first place I went. The 14-pound, 14-inch PowerNow saw quietly went to work at ground level cutting sideways into the toughened trunks that measured about six-inches through. The top cut blades – designed to be serviced with the saw's on-board sharpening capability – were aggressive and made relatively short work of each bush. I usually use a 16-inch Stihl for such chores, so I was impressed with the out-of-the-box performance of the little battery-powered saw. Oregon-Blount's new PowerNow battery chainsaw is a handy, light-duty saw that weighs in at 14 pounds and makes very little noise. The shrub removal was done before "fall" got to Oklahoma, so in more than 100-degree temperatures, the PowerNow went through three shrubs and was half way into the fourth when it abruptly stopped. "Well that's all the battery," I thought, so I swapped batteries and put the first one on the charger. The saw failed to start with the new battery! Then, I realized it wasn't the battery being exhausted at all – I had run the motor against a load long enough I'd triggered a thermal overload. Within a few minutes we were back to sawing again and finished the removal of the dozen shrubs – complete with cleanup – in less than an hour. Once during the test it became apparent the blades were getting dull, so a 2-3 second application of the sharpener while the blade was running put them back in top form. Actually the recommended 2-3 second sharpening cycle is generous! I would guess a half second would be plenty to touch up the blades, and it would make the blades last longer. Power for the PowerNow saw comes from a 40-volt battery pack that recharges in 20-30 minutes with the supplied charger. The saw is delivered with two batteries. The batteries recharge in about 20 minutes, so you don't have to take much time off if you have two batteries to alternate (the saw comes with two batteries). Like all chainsaws, the PowerNow has a bar-and-chain oil tank on its left side, and oils automatically as the saw runs. We found the system to work quite well. Chain adjustment is easy on the PowerNow, with a single large handle (you can make it work with gloves) plastic wingnut to unscrew before tightening the chain with a neat companion screwdriver that comes with the saw. A few turns with the screwdriver, tighten the big wingnut and you're back in business. The PowerNow is not a logger's saw, nor was it meant to be. 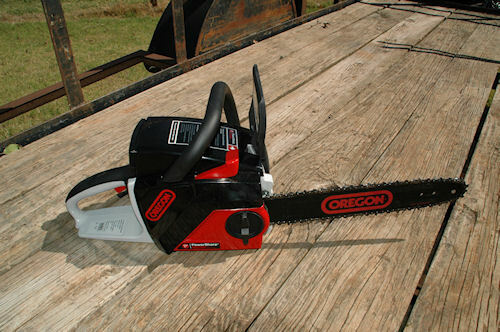 But, for someone who has only light cutting chores around the landscape, or needs a chainsaw only on occasion and appreciates the quiet, we think the battery-powered Oregon could fit the bill for a number of people. 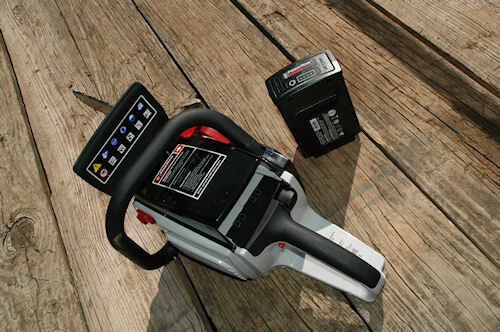 The suggested retail price of the PowerNow is comparable with similar size gasoline-powered saws.